Thank you to everyone who chimed into this thread. I intend to continue using both candles and lamps, and all the information and feedback helps. I have to agree with jwmcclin here, it's fast, free, and powerful. Do it! Good morning all-I couldn't find this question in the archives, so I apologize if this is redundant. Is it possible to burn lamps using just olive oil? I'm super-sensitive to kerosene. Thanks! You cannot fuel a kerosene lamp with olive oil (it is too viscous and has a different burning temperature); but you can certainly buy or make an olive oil lamp or a butter (ghee) lamp. For the purposes of this discussion, we are treating ALL liquid-fueled lamps in the same way, regardless of the nature of the oil they employ. Would this be a good way to work? Buy a 12" lamp and a mojo (and ask for just the bag without fixing it or praying over it) for a particular condition (along with the condition oil). Get some lamp oil and color it in a manner appropriate to the condition. Dissemble the mojo and place the contents into the lamp, along with a petition/personal concerns, condition oil drops, and lamp oil. And then light the thing up! As a particular example, if I wanted to do a Van Van lamp, I could put into a lamp reservoir the contents of a Van Van mojo, yellow- or orange-colored lamp oil, Van Van oil, and my petition/personal concerns? heartexalted, Yes, i suppose you could do that.You would colour the lamp oil yellow, not orange, by the way. Van Van oil is and always has been yellow. I have just bought a green kerosene lamp for prosperity in the uk - my situation is that they seem to have dis-continued selling kerosene - can i use some type of oil in the lanmp - if so what oil ? Blue Scorpio: Go to the hardware store, or general store, and look for "lamp oil." Making my first lamp and have a question of where to place my herbs and where to place lodestones? I only assume my herbs go where the oil is but my lodestones go up top? Please advise. I have a lamp like the one sold at LM 12" Kerosene Oil Lamp. Also on a resistance working of single candle with cubeb berries if saucer broke after burn could that mean I broke the resistance? 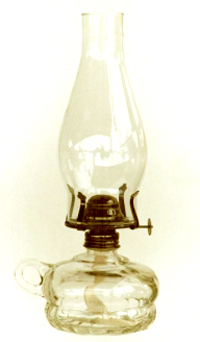 In making a kerosene lamp with lodestones, the lodestones go in the fuel reservoir, in the oil. You will need the proper size of lodestones, of course. This thread is not about divination on candles, so your other query goes unanswered. Please stay on topic. Thanks. In making a kerosene lamp with lodestnes, the lodestones go in the fuel reservoir, in the oil. You will need the proper size of lodestones, of course. Charisma: Yes, everything goes into the oil reserve of the lamp. Everything. Oil lamp is going great! However I have it low to keep continously going but its burning quickly. Oil ran out and wick is all most at its end before a full 2 days. I love the ideas of the oil lamps and am interested in the mini lamps but can not find them on the entire catalog listings. Can you please direct me to the page where the mini and regular size lamps are listed for sale? thank you so much for telling me where to find the oil lamps!!! I think this fits, though it might not technically be true conjure, as I don't know the origins of these songs. If off-subject, feel free to delete. Okay, this might sound a little stupid, but here goes anyway. When I pray my Psalms over my money lamp each night, and when I refill her, I sing the "lamp songs" I learned on the church bus when I was young. So it's the "This Little Light of Mine" song and the "Sing, Hosanna," songs. Since hoodoo is Christian magic, I thought they fit, and I thought it might help others. So, hey, there you go. In case anyone doesn't know the "Sing Hosanna" song. "Give me oil, for my lamp, keep it burning. Give me oil for my lamp, I pray. Keep it burning till the break of day. Sing Hosanna, sing, hosanna, sing, hosanna to the King of Kings. Sing, Hosanna, sing, hosanna, sing hosanna to the King of Kings." That's funny, i always sing "Keep Your Lamps Trimmed and Burning," another church song! Notice that at front left, and also arrayed in a row to the right, there are some antique Chinese iron oil lamps. These are for sale in the shop as well. Relevant chapters include "Oil Lamps" and "Altar Layouts for Lamp and Candle Spells," as well as individual spells utilizin lamps. Relevant chapters include "Oil Lamps in History and in Hoodoo" by Prof. Charles Porterfield and "Rustic Hoodoo Oil Lamps by Dr. E.
Both of those books and Henri Gamache's "Master Book of Candle Burning" are in the order I placed today. I guess I won't trip too hard on whether my little songs are true conjure or not, then, if you sing while you tend your lamps. I haven't had the chance to check out the videos yet, but I will tomorrow. Thank you most kindly for sharing them! I've looked through the inventory and haven't been able to find the green money oil lamp. Is it still available? Thanks! Nope, the distributor stopped supplying them alone, only in mixed-colour lots, and since green outsold the other colours 5-to-1, we had to stop ordering hundreds of lamps just to get a few green ones. As it is, it will take years to sell out the other colours! -- and they never did make red ones, either. Such is life. Ah, okay. That's a shame that the company switched their policy. Thanks for your response, Ms. Cat! I would like to create a rustic oil lamp from a canning jar for long-term work for enhancing my psychic abilities, dreaming prophetic dreams and to aid in divining while reading playing cards. I've selected all the herbs I plan to use. I have two questions: What carrier oil would you recommend for this lamp? Are there any particular mineral curios you would suggest? I've noticed the 11 ingredients I've selected so far are all dried herbs and roots. A good carrier oil would be sunflower or olive oil. Although there is no need to use any curios and roots and herbs are fine all on their own, items to consider could include cowrie shell which are used for divination (http://www.herb-magic.com/cowrie-shell.html) or a deer astragalus bone (which is used in a set of four for shagai divination). I really have enjoyed this thread, as it game me some additional ideas as to what I would add to my lamps. I also wrote out a specific petition/letter dressed it in oils I used for the lamp, and sewed it into fabric to place under my Guardian Angel lamp. The first few days my oil (it is a small lamp of 6 ounces) would be drained in 24 hours; after that with daily prayer it remains steady versus using all the oil fast. I love oil lamps! Consistency in regards to your petition and they are beautiful in their simplistic way. Can cooking oils be used in a lamp (e.g. olive oil, coconut oil, corn oil, vegetable oil, etc.)? On that note, I have some 100% pure roasted walnut oil on hand, the kind for salad dressing. I never use it, and would like to put it into service if it's possible. According to http://www.herb-magic.com/#Herbs-W the black walnut has different uses depending on which of its parts you're using - leaves for cursing and break up, while whole with husks for breaking the power of past love. What kind of magic energy might my walnut oil bring? As for my walnut oil, the label doesn't specify if the walnuts were black, Persian, English, or not, just that it's "100% pure walnut oil." There's a drawing of walnuts on a branch, but they're green, probably meant to depict young walnuts. The label also says, "handcrafted in California, in a 150-year old French tradition." If more info is needed, I took a pic of the label and could try to upload it, if it's permissible here. catherineyronwode wrote: You cannot fuel a kerosene lamp with olive oil (it is too viscous and has a different burning temperature); but you can certainly buy or make an olive oil lamp or a butter (ghee) lamp. For the walnut oil, since it is expressed from the nut, it would be good for getting over past issues (mostly love related) as you surmised. If it's gone rancid (which walnut oil can do quite easily), then use it in cursing work. Aura, thanks so much for your swift reply! Your answer prompted me to google lamps, and I found a DIY lamp from an AIRR worker's (defunct?) site that makes a lamp out of orange rinds and cooking oil. The site doesn't specify the kind of spells in which this orange lamp would be used, but it must impart a nice orangey smell when lit; I think I'd like to try making it. I know that orange the fruit and its flowers are associated with marriage and fidelity, while orange the color is associated with wealth, success and road opening... Perhaps this orange lamp will be good for general use? Or for love and money drawing in particular? As for my roasted walnut oil, could it still be used to get over past issues if there's a possibility that the oil isn't from black, English or Persian walnuts? I really have no way of telling from the label what kind of walnuts were used. And when you say "mostly love related" issues aura, do you mean that walnut oil would be to help someone recover from hurts borne from a lover, or to forget the love itself that one has for a lover? Then again, my walnut oil has been in the fridge for so long that I no longer remember when I bought it. Perhaps it's gone rancid by now. It might be best to reserve this oil for cursing spells, as you've said. Great idea, thanks for that aura! So I guess it will be another cooking oil for now. 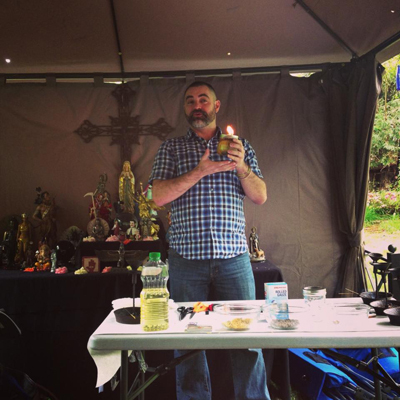 Does corn, vegetable, or coconut oil have a place in hoodoo? Thanks so much for reading my wordy posts. I know that many people use vegetable oil as a foundation for their lamps. Coconut oil is used for home and love work. An oil lamp is an old way of working; the herbs would go right IN the oil reservoir. Since the flame is at the top of the wick and the herbs at the bottom, with a fancy metal device separating them, the herbs will never catch fire. Lamp oil is expensive, though, and burns faster than candles -- so you might want to look into making a simple vegetable-oil lamp. Dr. E. described a simple design on the Lucky Mojo Radio Hour on January 28, 2012. (Discussion of oil lamps begins about 15:30; Dr. E gives two designs.) You could certainly make one lamp for your whole family, or a simple and inexpensive vegetable oil lamp for each person. So here are some questions on oil lamps ..
How many items? Is it a odd number like in mojo bags? How does merging "item specifics" work with oil lamps? For example in Hoodoo Herb and Root Magic by Catherine Yronwode near the back it has a list of ingredients under specific tasks.. I want to make a protection lamp for Protection, Keep Unwanted Visitors Away, Warn of Evil,Bar People, Return Tricks, and Law Keep Away... and for good measure a silver dime... Alot of the ingredients do cross over to other categories. And how much of what would I need? I order some vigil candles to tie me over and to assess the situation.. But, I do think that you would have to make more than one lamp. That's a lot to ask of one lamp. I think there's just too many petitions here. I would prioritize and decide what petitions flow with each other. For instance: protection & unwanted visitors. Reversal and Return tricks, etc. Every root worker is different, but I like to use Odd numbers. Some people count all herbs as one ingredient, others count them out individually. 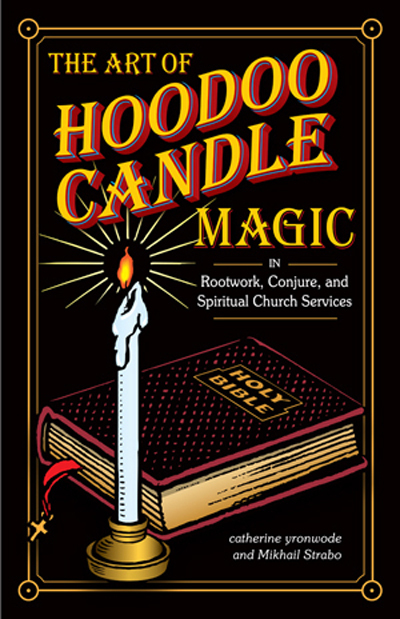 Thankfully I ordered "THE ART OF HOODOO CANDLE MAGIC IN ROOTWORK, CONJURE AND SPIRITUAL CHURCH SERVICES" book with the candles, hopefully soon I'll be receiving the order.. Hopefully there will be answers to me questions from it... It'll be sometime until I'll qualify for the correspondence courses..
RunningBlue: Perhaps you could make one strong lamp to burn for General Protection and write out a petition for all of the different Specific Protections you have listed above for us. If this is in no way feasible to do, then go ahead and create many different lamps for each very specific purpose. My wife and I have four different lamps we tend...all for very different Conditions. Also, as a note, not all mojo bags require you to use odd numbers of items. Some use that "rule" and some don't. I read on Mama Starr's blog that she made a "Personal Oil Lamp" to help in all areas of her life.She says you can add an array of items in it such as angelica,lodestone,rosaries.I was wondering if anyone has had experience making one of these lamps,and if so what LM products did you include. Yes, this looks good. You're in the right direction. Thanks for your response, Miss Aida. I've read this thread and learned a little here and there about oil lamps and I am intrigued by them. I have been learning how to create my own using a glass jar and olive oil. I suppose my questions may be more fundamental than just pertaining to oil lamps. I would like to create a FWOP oil lamp that I can protect my whole family with (parent, brothers, sisters and their families - about 24 people). First of all, is an oil lamp an effective way of doing this or would you recommend a different method? Would it be acceptable to have one petition that would be for everyone and then add in each person's picture with their name written multiple times on the back? I don't like the idea of writing out the same petition 24 times, but I'll do it if necessary. If the petition will be the same for everyone can I just use one? Also, I have read of people placing petitions under the lamp or in the oil reservoir of the lamp. What would you suggest in this case? I would really appreciate your feedback and expertise. I want to help more people...especially those I love most and I feel that this may be a great way to do it! PS I will of course be using Lucky Mojo's Fiery Wall of Protection Oil. What ratio of conjure oil to olive oil would you suggest generally? Oil lamps were the original candle set for work, then candles became easier and cheaper and replaced the lamps. Still a great and traditional way to work. Im sure if LM still sells them because I remember seeing them on the site for a min. You certainly can add all 24 people, I think the only problems (to me at least) is that, one, you are spreading a lot of energy over a large group of people, two, the container can give signs about the work and when 24 people are in one jar you dont know who or which person the signs are for. (such as with a series of candle, any one of which can be weak and not strong). With a lamp, you may wonder, is that for all the people or just one? same problem you face if you add a lot of people to a honey jar. Well my hubby has 2 oil lamps that we did not use but now i cannot wait to put them around the house. I do have a questions though, how much LM oil can I add to the lamp fuel? After i add the oil to the resevoir will the lamp give off the scent of the LM oil or not. I really want to do a MoneyHouse Blessing lamp. Come To Me is usually used to draw in a new partner, to bring them in. If you want to bring back an ex, Return To Me is used if there hasn't been a fight while Reconciliation is a good choice if there was friction. For the love lamp, Return to Me, Reconciliation and Love Me would be a good oil combo, but only a tiny drop of each since you don't want the lamp to smoke up or the oils to gum up the wick. Herb wise, a nice combination to draw back and keep a lover would be a pair of matched lodestones (or lodestone grit if the lamp is quite small), two balm of gilead buds, damiana, honeysuckle flowers and passionflower. My first question is I read a lot about using condition oils in lamps but what about just a pinch of satchet powder? 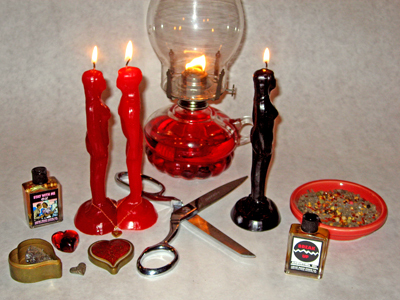 I want to create three seperate oil lamps and place them on my altar and burn them 24/7. They will be for Financial Abundance, Healing, and Psychic Mastery. I plan to get three identical oil lamps (clear glass), and place them in three seperate large bowls filled with sand (for fire safety and stability). For each lamp my idea is to mix together various satchet powders (specific to my goal) and place a pinch of the combined mixture in the reservoir along with a curio (specific to each goal) and lodestone . I then plan to add a hefty amount of the combined satchet powders in the sand surrounding each lamp. Buried in the sand, out of sight, will be a petition paper for each lamp. I also figure I can add/remove herbs and curios from the sand as needed. I will also keep a seperate glass jar of each of the specially combined satchet powders for when I either need to add another pinch to the lamp when I refill the oil, or to sprinkle on me when i want to tie myself in directly with the power of the individual lamp. As for curios I am thinking one coin of each denomination for the abundance lamp, and a key for the psychic mastery lamp. I am not sure of a good curio for overall health. Any suggestions? A John The Conqueror I am sure would be good if it was just for me, but I plan to use these lamps not just for me, but place additional petitions on them for other people when needed. I think that's a good idea as long as it is a very small pinch in with the oil. Very small. I'm afraid that the powder may disperse and interrupt the wick saturation. And I worry about clogs. I love the idea of the sachet powders in with the sand that that holds the lamps. That is genius!! Your lamp sounds amazing, jackdreher! I have a sort of broad general question. 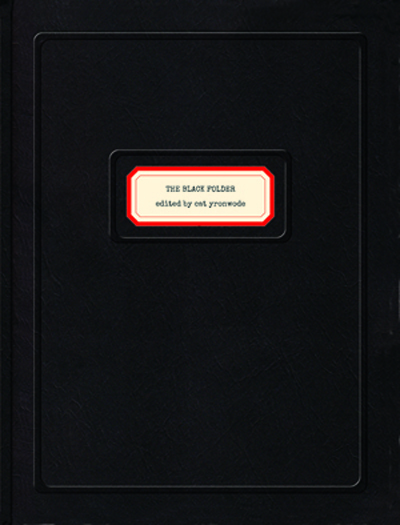 I'm drawn to simple and discrete work. in my experience I have found oil lamps and incense and prayer a potent combination..
though the last time I have used this combination I stopped the work before I could see fruition. I was wondering, is it useful to have one oil lamp always going on for a long term goal, say , to make someone ultimately fall in love with you--or even for you two to be in a committed relationship. and then to do candles or other oil lamps for smaller goals working towards the broad goal while having the oil lamp for the long term goal, going on in the back all the time? Some people do it both ways. Let your intuition guide you. Some workers also us container spells in the same way. So you could really mix and match. Oh, I'm worried. I just moved to a new flat, and am completely banned from burning candles or lamps of any kind. I'll adjust re: the candles... but the oil lamp was a long, really necessary working prescribed by Prof Porterfield on the LMCC Hour when I called in for a reading to break the cycle of love/work bad luck teeter-tottering. Now I can't burn it at all, and it will have to sit in storage. Well... is the working done? Is there any way to take what's been cooking in the lamp and continue it? The roots, prayers, oils, and curios are all in there... I just will not be able to fill it or light it. Can you light it outside? I have a friend who has the same problem. He rented a very small storage unit where he performs his magic, etc. No, it isn't... technically it's the manager's private property, which I'm renting space in, and they have the right to allow or not allow activities that they think will damage their property. Can't smoke tobacco in here either. Well, I have a friend who is happy to take my dressed candles to her place to burn, but this lamp is big. Sigh. I'm not sure what else I could advise. I doubt the lamp will work with any speed with the fire.